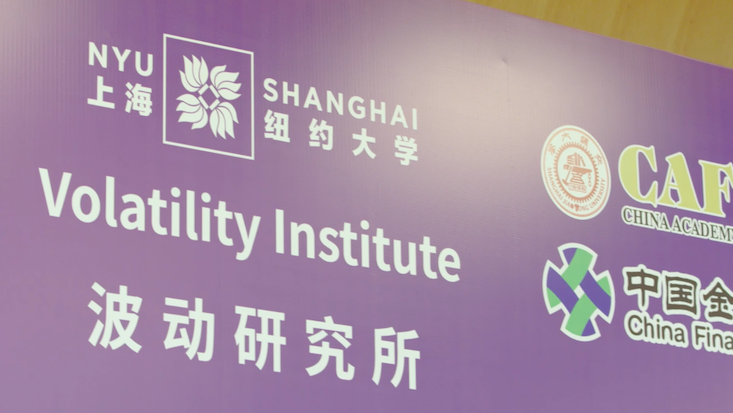 About 200 scholars and economic market leaders gathered at NYU Shanghai for the The Volatility Institute at NYU Shanghai (VINS)’s Fourth Annual Volatility Institute Conference on November 17. The conference, co-organized with the China Academy of Financial Research and China Financial Futures Exchange brought participants together for panel discussions and research presentations related to the conference’s theme, “Financial Implications of Geopolitical Risks,” as the geopolitical shocks of the past few years have become a major driver of global market volatility. The all-day event started early, with opening remarks from Vice Chancellor Jeffrey Lehman. One of the two keynote speakers, Robert Engle, 2003 Nobel Laureate in Economics, director of the Volatility Institute at NYU and VINS advisory board member, proposed a three-step action plan that could help the Chinese market mitigate the geopolitical stress that it is currently suffering from. “Reduce debt,” “reassure investors,” and “reopen trade negotiations” were the three strategies Engle suggested. Keynote speaker Eric Ghysels, Edward Bernstein Distinguished Professor of Economics at UNC Kenan-Flagler Business School, shared his study on artificial intelligence as investment advisors and its potential for the future.